Children's literature provides powerful learning and entertainment opportunities that are catalysts to creativity and research. Click each title below to browse or order. Extension links for each book will be provided! 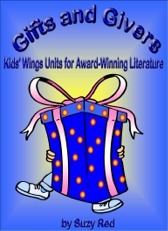 In addition to the new literature, Gifts and Givers includes units on other books that make excellent literary partners. How do Kids' Wings activities for these books transform your classroom? They provide balance, problem solving, group activities, and inspiration by giving you essential Imaginative Activities and Testing Activities to use with authentic literature! Now complete, the Gifts and Givers package includes over 500 pages of activities, 7 "Jeopardy-type" games, and 9 Karoke-type songs! the latest in integrated curriculum. Your purchases through this website help keep our website doors open to you free of charge. If you would like to order novels or picture books, please click on our titles that are links which will take you directly from us to Amazon for your purchase. Texas Bluebonnet AwardSM is a service mark of the Texas Library Association, which is in no way affiliated with Kids' Wings or Suzy Red. Use of the Texas Bluebonnet Award mark in these materials does not imply any endorsement of any kind on behalf of the Texas Library Association. The Texas Bluebonnet Book Master ListSM was selected by the Texas Bluebonnet Award Committee of the Texas Library Association.